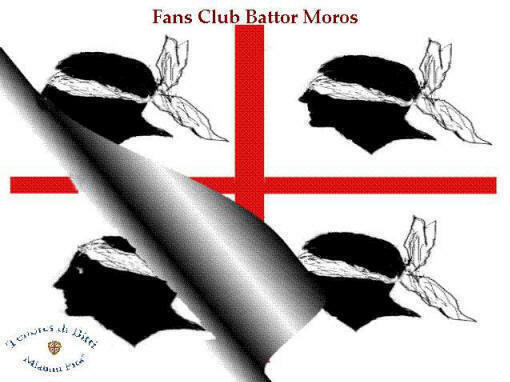 The a cantu a tenore was proclaimed by the UNESCO in 2005 "Masterpieces of the Oral and Intangible Heritage of Humanity"
It's online our funsclub "Battor Moros"
Who Michelangelo "Mialinu Pira" was? The group was born in Sardinia and takes its name from the well-known anthropologist Michelangelo “Mialinu” Pira from Bitti. All the members have been learning the traditional singing since they were children. After a careful preparation the group began to perform the ancient melody in many squares, theatres and churches of Sardinia , Italy and abroad:-as in Germany , Denmark , France , Canada , Dubai (Emirates A.U. ; the performance was successfully broadcast by Abu Dhabi TV), Norway ( Trondheim : international Olavsfestdagene, broadcast by the national radio ), Czech Republic , Spain (with Hevia), Belgium , Nederland . 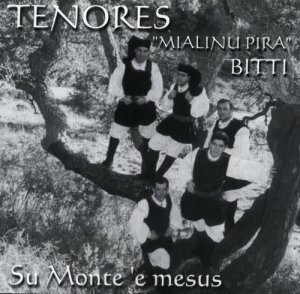 The Tenores di Bitti “Mialinu Pira” performed their first record “Su monte’e mesus”.It is also remarkable their participation to the Christmas Concert for the Pope on December 2001 with artists as Hevia ,Terence Trent-Darby, Cranberries, Randy Crawford. The concert was broadcast by “CANALE 5” on world vision with great appreciation of public. They were also guests in the telecast “Quelli che il calcio …”, on the national TV RAI TRE . - July 2003 -- Participation in two important international festival in two towns next to Brno, in the Czech Republic, Namest nad Oslavou and Uherskè Hradiste. - September 2003 - Really interesting collaboration with Hevia, the famous Asturian Bagpipes player who involved the Sardinian group in his concert in Avilès ( Spain ) to open his winter tour. In the same month the group received good reviews from the important foundation named after the greatest Sardinian folk singer Maria Carta. In the musical event a careful and expert jury awarded the group and performance for the section "traditions". The group works carefully for the preservation of this tradition by keeping courses in the school(on 1999 they have kept a Regional course for Tenores Singers) and trying to merge this traditional singing with other genres of music as classical , on theatres …. Directly from the heartland of Sardinia, the city of Bitti in the region of Barbagia, known for its polyphonic singing, which many experts find one of the most expressive forms of singing, the highest peak of vocal art - come Tenores di Bitti "Mialinu Pira", which is the nickname and the surname of the famous anthropologist Michelangelo Pira. When one hears the songs for the first time they might seem primitive and hard, like a voyage in the prehistoric age, when people imitated the sounds of nature. However, four man voices one of which chants the main melody and the other three accompany it in rhythmic pronunciation of syllables, together with the guttural emission of the voice which remind us of the primitive vocal music from Oceania and Africa, one achieves an unusual harmony and a pleasant singing. The Tenores’ singing is one of the more ancient ways of singing in the Mediterranean area .Nothing about its origins is sure, but the historians maintain that this traditional polyphony goes back to 3000 years ago. The singing is made by four male voices (oche, mesu oche, bassu and contra), the main feature of this polyphony is represented by “bassu” and “contra” because of their guttural and ancestral sound. The songs are profane poems speaking about the shepherds and their solitude in touch with the nature, or religious, referring to the popular world and its traditions. Below find a list of our main performances in concerts or event form 1996 ‘till 2005. 1999 from september ‘till december of this years the Tenores di Bitti “Mialinu Pira” kept courses in schools to teach people how to sing ‘a tenore’. 2001 from 6 to 16 June they sing in Abu Dhabi (Emirates) at the theatre of the ‘Cultural Foundation”. The performance was recorded and broadcast by the National TV “Abu Dhabi TV SAT”. 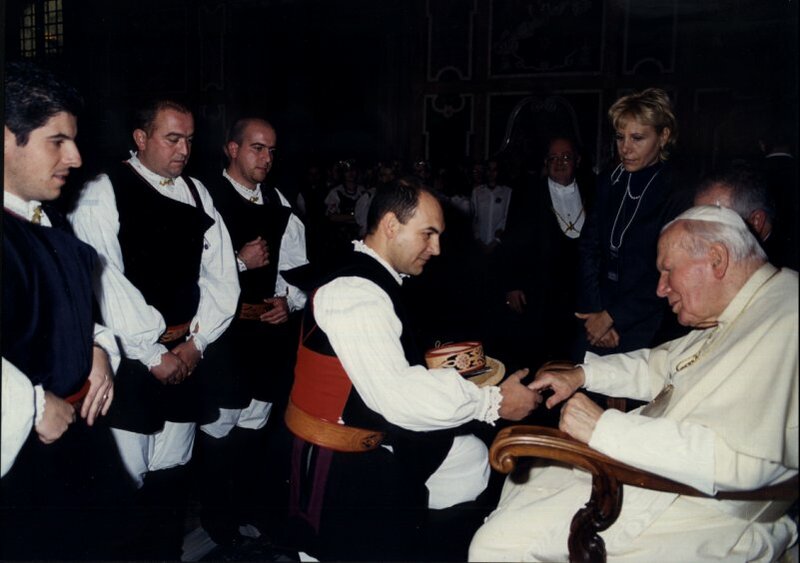 2001 in December partecipate in the traditional Christmas Concert in the Hall Paolo VI at the Vatican in the presence of the Pope Giovanni Paolo II with many other artists of international fame as Hevia,. , Randy Crawford, Terence Trent d’Arby, Russel Watson, per l’Italia Elisa,. Edoardo Bennato, Massimo Ranieri.The event was broadcasted in Italy by Canale 5 and RTL102.5, it was also in worldvision. 2002 In december they partecipated in the festival Olavsfestdagene in Trondheim, Norway. In this occasion they performed their own concert in the Nidaros Cathedral, but also togheter with the band “Enzo Favata Quintet” in Our Ladiy’s Church.The concert was broadcasted by Norwegian Broadcasting, the national radio. 2003 The 7 September they were invited by the well known spanish player of the Asturian Pipes Hevia, met at the Christmas Concert, to partecipate as special guest in the event ‘Dia de Asturias, in the town of Aviles, near Oviedo. The Tenores performed with Hevia, the flamenco guitar player Juan Manuel Canizares and the traditional singer M Luz Cristobal Caunedo. 2003 19 november Concert Utrecht (Olanda) Teatro RASA. This concerts were performed within the Festival Europalia Italia 2003. This event is organised every second year since 1969 to celebrate and promote the culture of a country which is everytime different. That’s why this year, in coincidence with the Italian semester at European Parlament, exibitions, performances and other events in many cities in Belgium were celebrating Italian culture, History and art. Among many guests, the Orchestra Filarmonica La Scala with iuts director Riccardo Muti. The Tenores and Nuova Compagnia di canto popolare were the only Italian delegates for the traditional music. 2004 10 september Concert in Luxembourg, organized in cohoperation with the Italian Embassy in the Italian Isitut of Culture of Luxembourg. 2004 8 october concerto Concert in Slovenia at Liubljana in the theatre Cankariev Dom, organized in cohoperation with the Italian Institute of Culture. 2005 6 January. They were guests in the broadcast “Affari Tuoi” in the national chanel RAI UNO, directed by Paolo Bonolis. 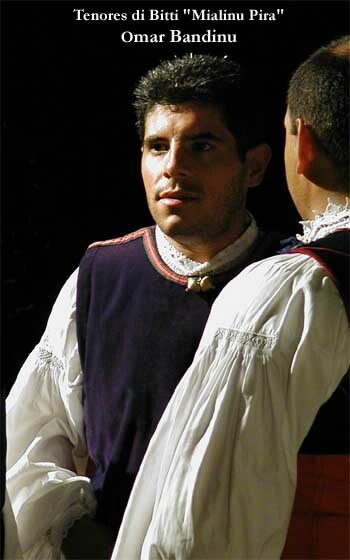 In this successful TV broadcast the song “Milia Vattu sa trotta” became the Sardinian “National” Inn. 2008 10 Aprile Concerto al Teatro Sangiorgi di Catania stagione concertistica dell'Ame.